You’ve made your New Years Resolution and are trying very hard to keep up with the schedule you’ve set for yourself but sometimes life and work get in the way. Work is important but so is sticking to an exercise routine. In fact, taking time out for exercise has been shown to increase productivity. In this article we show you how to exercise at work. Exercise at work can be quick, easy, and most helpful. All you’ll need is a resistance band! If you don’t own a resistance band (pictured above), we sell them at Baudry Therapy Center and you can also find them at many sporting goods stores. 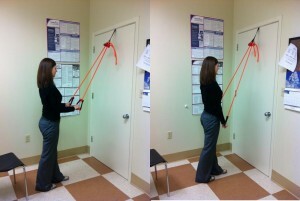 Before you begin, pay attention to the resistance band’s position in the door. Also, make sure the band fits snugly into the door frame to avoid injury. If you have any questions about the exercises below, be sure to let us know by leaving a comment. Seated Rows: Sitting in the chair, resistance band in both hands at chest height pull elbow back toward the wall behind you and squeeze shoulder blades together. Repeat 10 times. 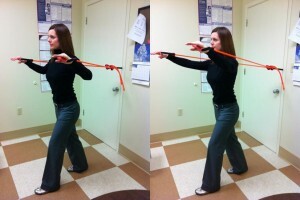 Lat Pull: Grab both end of the resistance band. Hold arms above shoulder level keeping shoulder blades down in your back, bend elbows approximately 90 degrees pulling back and squeezing shoulder blades together. Repeat 10 times. Bicep Curls: Sit on edge of your chair extending arms. Maintain the elevation of your elbows as you bend them bringing your hands toward your head at a 90 degree angle. Repeat 10 times. 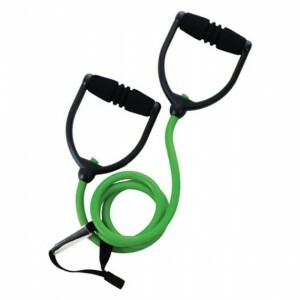 Tricep Extension: Hold handle in both hands. Flex elbows at your side to 90 degrees. Extend elbows so that your hands are at your side feeling the contraction in your triceps. Repeat 10 times. Chest Press: Begin facing away from the door with hands shoulder level and elbows bent. Extend elbows bringing hands in front of your chest. Squeeze hands towards each other to maximize muscle contraction. Repeat 10 times. 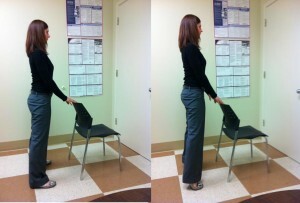 Chair Squats: Stand with feet hip distance apart. Bend knees and stick bottom out as if going to sit in a chair. Do not allow knees to bend past toes. Squeeze glutes as you return to standing. Repeat 10 times. Calf Raises: Stand with feet shoulder width apart. Keep knees straight as you lift your heels going up on the balls of your feet. Repeat 10 times. 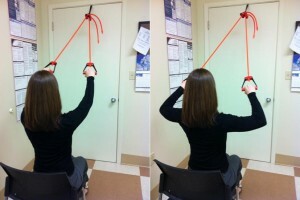 Hip Extensions: Rest forearms on the back of the chair or on your desk. Bend knee to 90 degrees. Push through your heel towards the wall behind you. Concentrate on the contraction in your glutes. Repeat other side. Repeat 10 times. Finally, if you need to get your cardio in for the day, skip the elevator and take the stairs anywhere you go. Remember to exercise safely and let us know how these exercises at work, works for you! Good luck!